Ask Your Shoreline Dentist, What are TMJ and TMD? Ask Your Shoreline Dentist: What are TMJ and TMD? If you’re suffering from any of the painful symptoms listed above, a consultation with your Shoreline dentist, Dr. Co, can help you identify the causes of your discomfort and what solutions may be right for you. There are several non-invasive treatments Dr. Co may recommend to help, including over-the-counter pain medication, application of an ice pack to the area, simple jaw stretches, and eating soft foods. 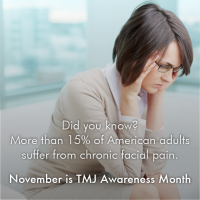 You don’t have to suffer permanently from jaw, neck, and facial pain caused by TMD! The team here at Shoreline Dental is skilled in helping Shoreline TMD sufferers find relief. Call us at 206.440.0065 to book your free TMD consultation today!